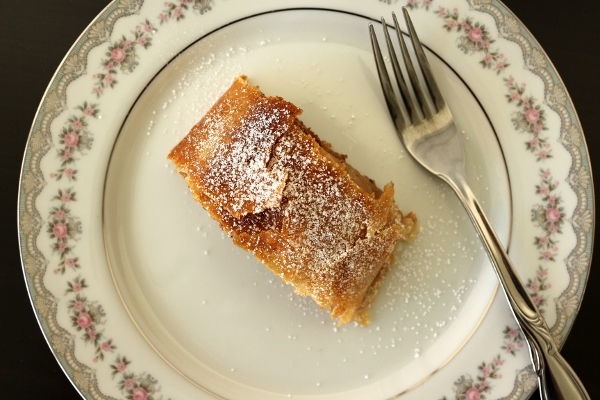 Normally when I think of popular European desserts, my mind immediately goes to French and Italian classics, however there are quite a few German desserts that are outstanding and absolutely worth the effort. 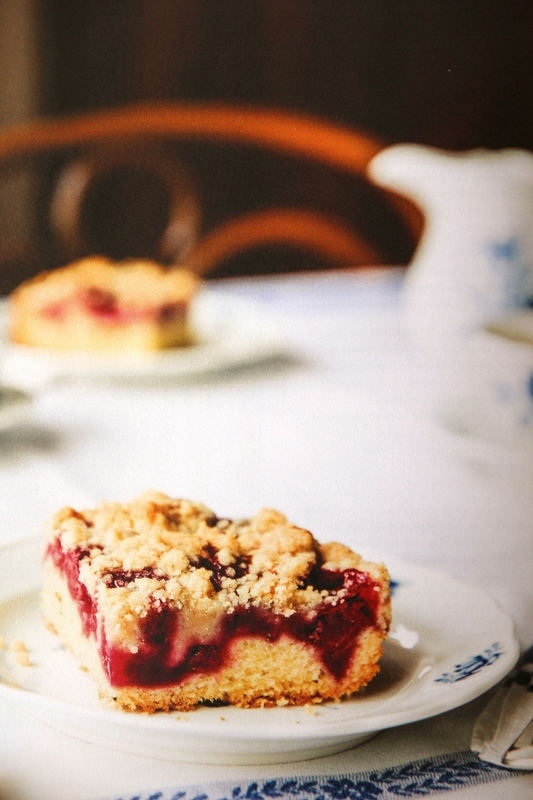 I recently received a review copy of Classic German Baking by Luisa Weiss. This was a fun surprise because my experience with German baking is certainly limited. I've made pretzels on multiple occasions in the past, as well as apple strudel once in culinary school, but otherwise, most of these classics are new to my cooking repertoire. I was pleased to discover this robust cookbook is filled with 100 classic German recipes for baked goods, both savory and sweet. There are extensive introductions to each recipe, but less photos than I would normally like. Many photos are of picturesque German architecture, but I would have preferred more photos of the recipes themselves. This would perhaps be my only complaint, but the value of the information provided, in great detail and authenticity, makes up for it. With that said, I've only tested one of the recipes so far, but had outstanding results. 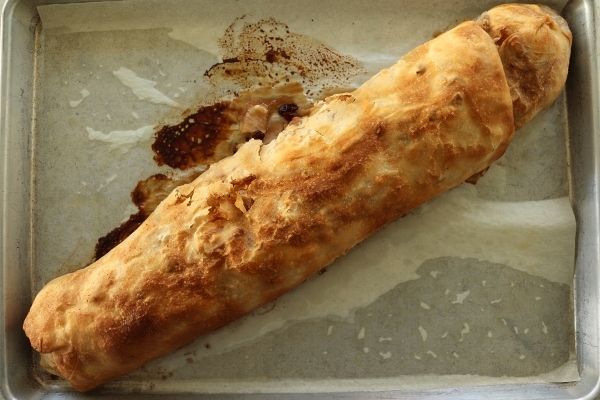 I have made traditional apple strudel many years ago in culinary school, with hand-stretched dough, but had never attempted it on my own without culinary supervision. It's a dessert I adore, so I was thrilled to have the opportunity to try this recipe. Weiss also includes sweet variations of strudel featuring plums as well as quark, as well as a couple savory versions filled with cabbage and potatoes. 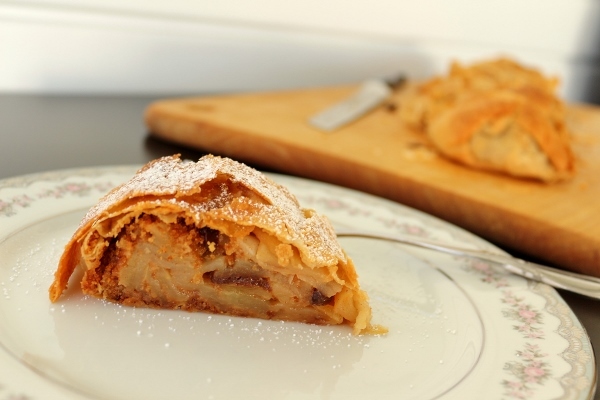 I would very much like to try those recipes in the future, but since it's still apple season, a traditional apfelstrudel is perfect. The recipe begins with the dough, which is supple and smooth, and surprisingly easy to stretch by hand until it's paper-thin. 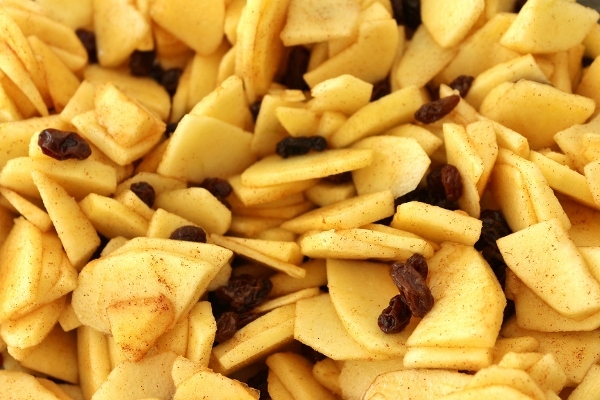 Apples are tossed with lemon juice, sugar, cinnamon, and rum-soaked raisins. Toasted, lightly sweetened breadcrumbs create a barrier between the apple filling and the dough. A kitchen towel (or in my case a clean bed sheet) is used to assist with the rolling of the strudel, and it's then slathered with butter and baked until golden. Although the recipe can seem intimidating, it's really not that difficult. I had a bit of kitchen help peeling, quartering, and coring the apples while I simultaneously sliced them, but otherwise, I only spent about 1 1/2 hours on the entire process before my strudel was ready to bake. That includes, making the dough, resting the dough, preparing the apple filling, toasting the breadcrumbs, stretching the dough, and assembling and rolling the strudel (and taking photos!). Not too shabby. I found a slight editorial issue in the Apfelstrudel recipe, where it indicates to melt the remaining 5 tablespoons or 115 grams of butter, but really that would be 75 grams (what is remaining after using the other 40 grams with the breadcrumbs). I also had a slight leak on one side of my strudel, but it was nothing major, and the finished result was still fantastic! Well there you have it, folks. Great success! I definitely have my eye on more of these recipes. I plan on making the Black Forest Cake for a future cake-worthy occasion, such as a birthday. 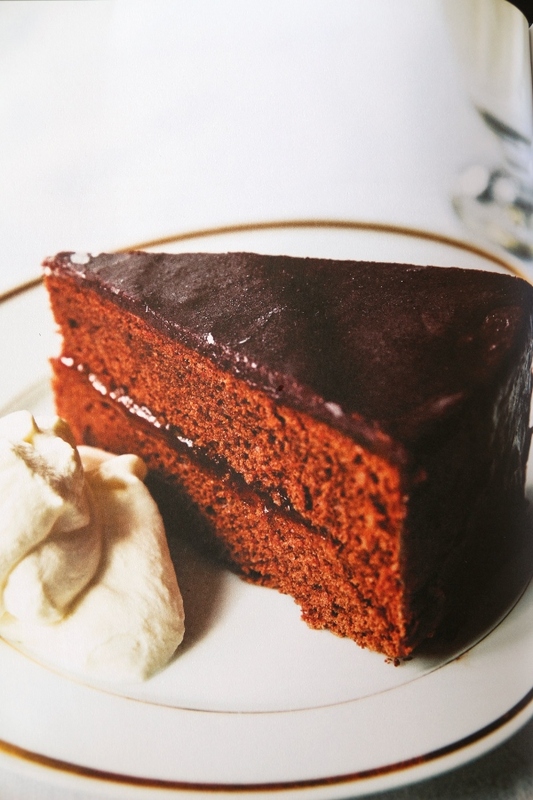 I'm also really looking forward to trying the Sacher Torte, as well as many others. While some readers have had concerns about the minimal amount of yeast in many of the yeasted recipes, I haven't tried these out myself yet so I cannot comment, but my experience so far as been very positive. This is a book I will use again, and would happily recommend to fellow bakers. To prepare the raisins: The day before you plan to bake, place the raisins and rum in a small nonreactive bowl and cover. Set aside for 24 hours. To make the dough: The day of baking, make the dough. Combine the flour and salt in a small bowl. Pour the oil into the flour mixture, and then slowly add the water, using your index finger to stir. The mixture will be very wet. Continue to stir with your fingers, and as soon as the dough has come together, dump it out onto a work surface (you may lightly flour it if needed, but once you get started with kneading, you won't need to add more) and start kneading the dough. Knead for 10 minutes (set a timer; the time will pass faster than you think). 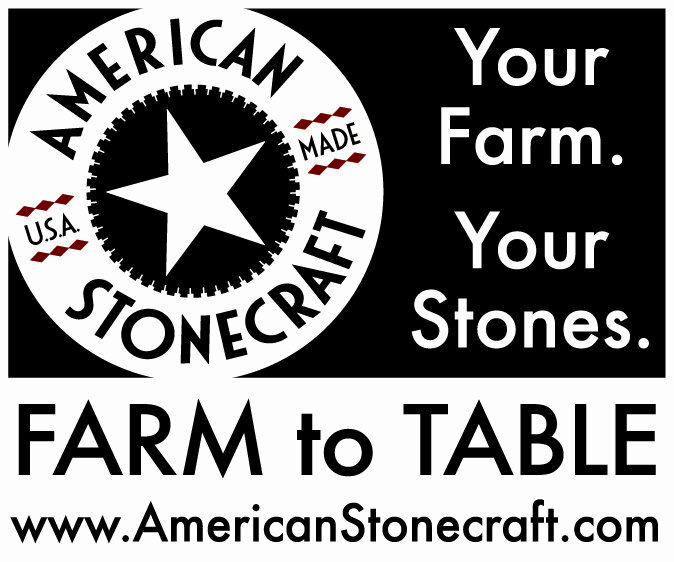 At the end of the kneading, the dough should be soft, supple, and silky to the touch. Form it into a ball and place it on the work surface. Invert the bowl over the dough and let it rest for 30 minutes. 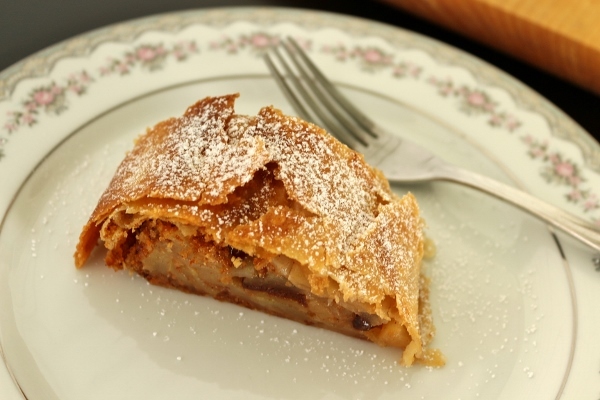 While the dough is resting, prepare the apple filling: Peel, quarter, and core the apples. Slice the quarters thinly, and then cut the slices in half crosswise. Place in a large bowl and toss with the lemon juice, sugar, and cinnamon. Add the plumped raisins and any rum left in the bowl. Melt 3 tablespoons (40 g) of the butter in a small pan over medium-high heat; add the breadcrumbs, Vanillezucker, and salt. Stir to coat and then cook the bread crumbs, stirring constantly, until they are golden brown and very fragrant, 5 to 8 minutes. Don't let the bread crumbs burn. Set aside. Heat the oven to 400 degrees F. Line a baking sheet with a piece of parchment paper. Melt the remaining 5 tablespoons (75 g) of butter in a small pan and set aside. On your work surface, spread out a clean cotton or linen kitchen towel that measures at least 24 by 32-inches (I used a folded bed sheet). The long side of the towel should be horizontal and the short side vertical; this is how you want the dough to be positioned later when you fill it. Sprinkle flour lightly over the towel. 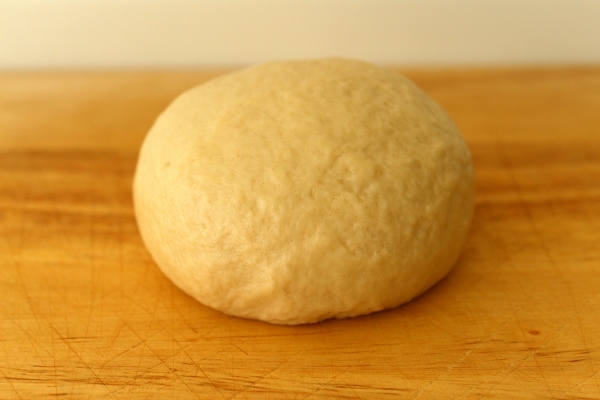 Place the dough in the middle of the towel and roll it out several times in both directions with a tapered rolling pin until it's about 10 by 13 inches. Then ball your hands to loose fists, put them under the rolled-out dough, and gently start stretching out the dough using the back of your hands. Alternate with pulling on the dough gently with your fingers to continue stretching the dough. This takes patience and some confidence; you don't want the dough to rip, but you do need to stretch out the dough with some assertiveness. If it does rip, press the dough together again around the rip. 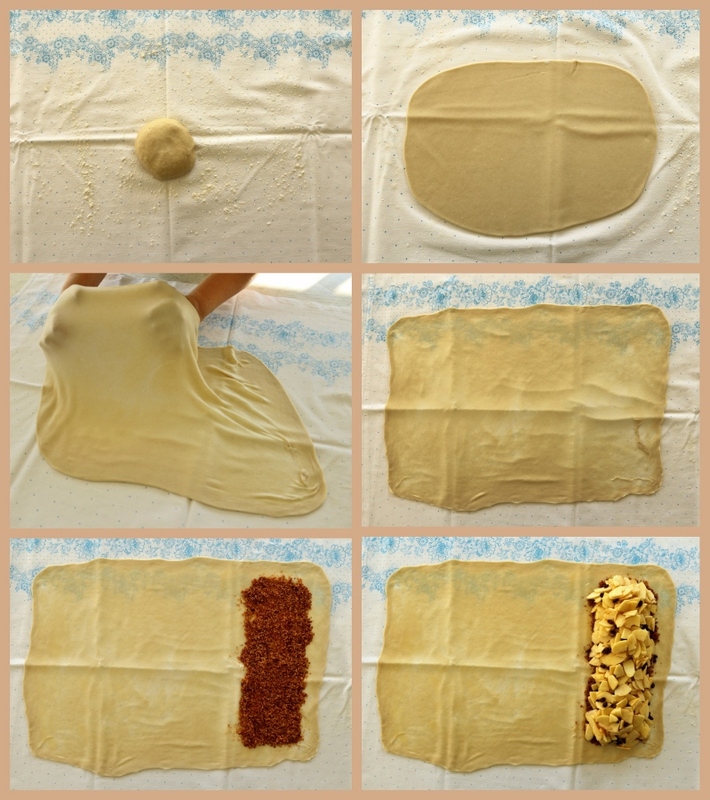 Continue stretching out the dough evenly until it measures 16 by 24 inches and is thin enough that you can see the pattern of the towel through it. Make sure you pull the edges of the dough as thin as you can, too. The dough should be uniformly thin all over. Brush the dough evenly all over with some of the melted butter. On the right side of the rectangle, distribute the toasted, seasoned bread crumbs from top to bottom over one-quarter of the dough, leaving 1 1/4-inch border at the edges on the top, bottom, and right. Drain off any juices that have accumulated at the bottom of the bowl of apples and raisins, and then pile the apple mixture evenly over the bread crumbs. Gently pull the top and bottom edges of the dough over the sides of the filling, stretching slightly if necessary, and then pull the right edge of the dough up and over the filling as far as it will go without tearing. 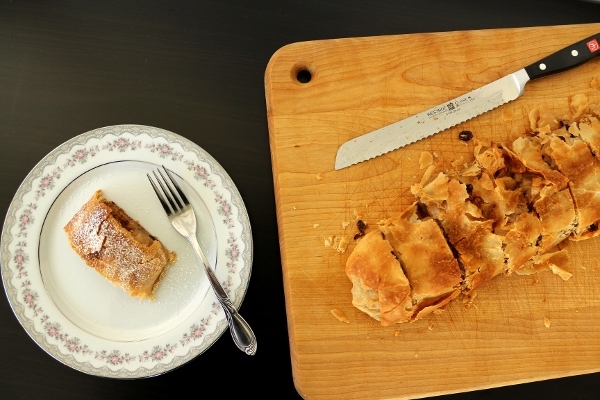 Working carefully, use the towel to roll up the strudel all the way. 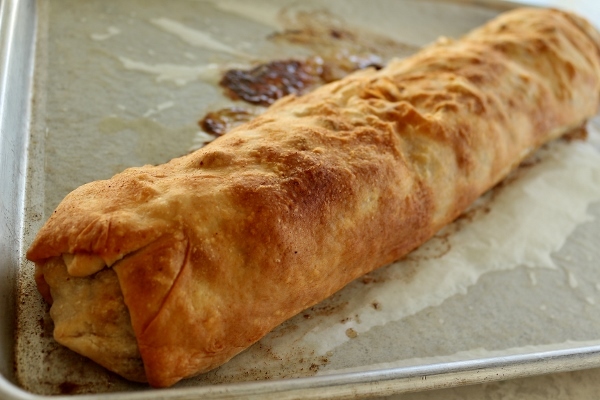 Using the towel as a sling, gently roll the strudel onto the baking sheet with the bread crumbs on the bottom. 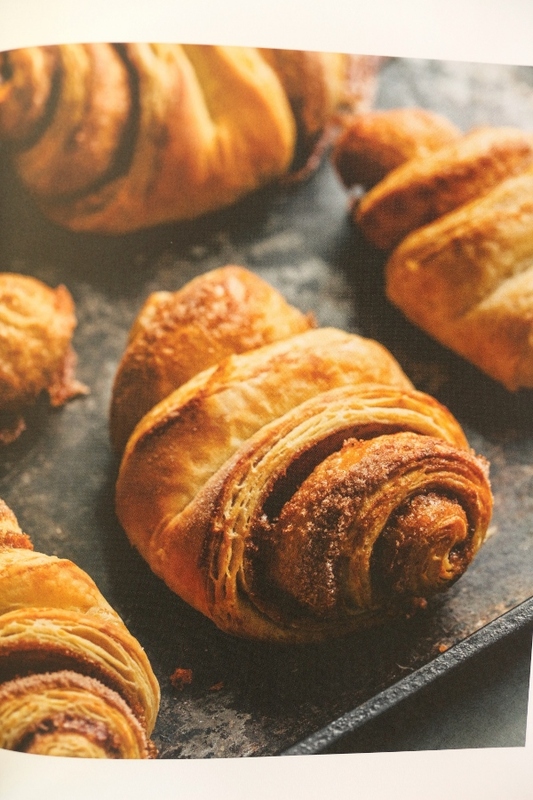 If the strudel roll feels sturdy enough, you can instead transfer the roll with your hands. 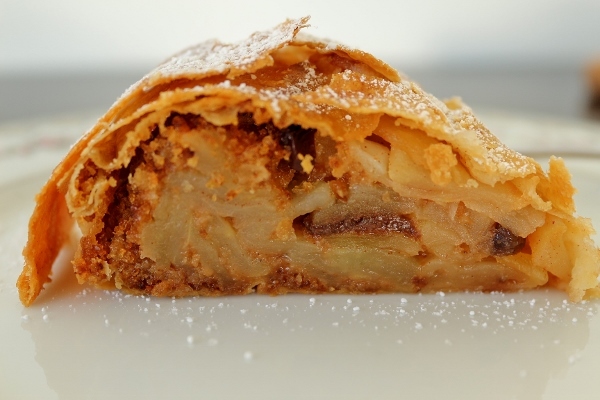 If the strudel is lumpy or larger at one end than the other, use your hands gently but firmly to form the strudel into a uniform shape--it should be the same thickness all the way along its length. Brush the strudel liberally and thoroughly with more of the melted butter. Place the baking sheet in the oven and bake the strudel for 15 minutes; remove from the oven and brush the strudel thoroughly all over with more of the melted butter. Rotate and bake for another 15 minutes; remove again and brush liberally with the remaining butter. Rotate again and bake for an additional 10 to 15 minutes. 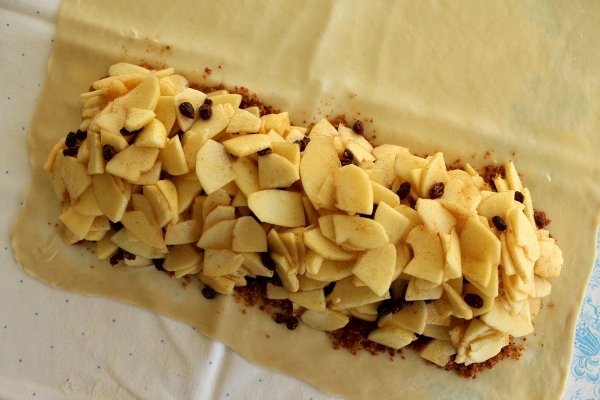 When ready, the strudel should be crisp to the touch and a deep golden brown.